Happy Thursday. One more day till the weekend :) I woke up this morning where my left eye is all red and puffy so I'm trying to squint as I type this lol. So Valentines is coming up. It's on a Saturday this year too, yay! I wanted to do another collaboration with a fellow youtuber to do a look. Some of you might remember my last collaboration with MissChievous on our insect themed Halloween looks. This new collaboration is with the beautiful and talented MsDebraMaye from youtube. She's a Filipina representing Canada. She's a relative newcomer to the youtube scene but is doing well already. I wanted to give her an exposure to my viewers to give her a subscriber boost and vice versa. Our theme was Naughty Vs Nice looks for Valentines. I did the Naughty and she did the Nice. My objective was to do something crazy and out there. 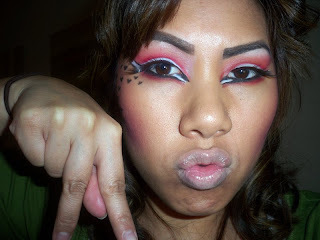 This is a sort of Kat Von D inspired/feline/rock star look. 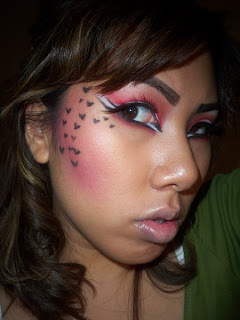 To be honest, this was my "Screw Valentines Day" look. 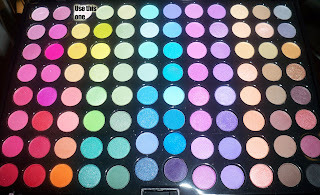 You know how most guys are averse to bright and funky makeup...if you have a date or don't, rock whatever makeup you want to wear! Clearly, this look is a bit on the fantasy side. If you want to rock it, go for it. If not, you can definitely tone it down. Wow your look is too cute!!! that's amazing! very creative, love it! btw - can't wait to see how you like the lucido l curling lotion, and the mandom.... and the legere!!! Very talented. I'll have to check out the Nice version of this too. I'll show this to my boyfriend and say I'll do the "Screw Valentines day" or the "nice" look depending on where he takes me haha. 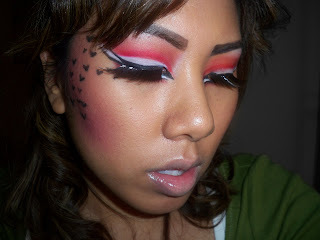 That eye makeup is INSANE! damn girl i am with you! screw valentine's day! You are def one heck of an artist! That really came out good mama! Aww...Debra Maye...love her singing too. You're so sweet! What a cute concept - naughty and nice. I think my bf would be taken aback if I wore your look out hehe. But you're simply amazing at what you do Ren! This look amazing!!! cool cool cool!!! Hi there-what a totally gorgeous look, stunning my dear! 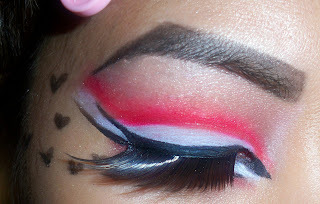 omg my bf hates dramatic makeup too =( i love this look....you look like a Vday Superhero! girl you are intense i LOVE IT. i sooo want to go to hot-lanta!